On their debut Southernplayalisticadillacmuzik, Big Boi and Andre 3000 were OutKast, preternaturally gifted and mature Dungeon-dwellers. 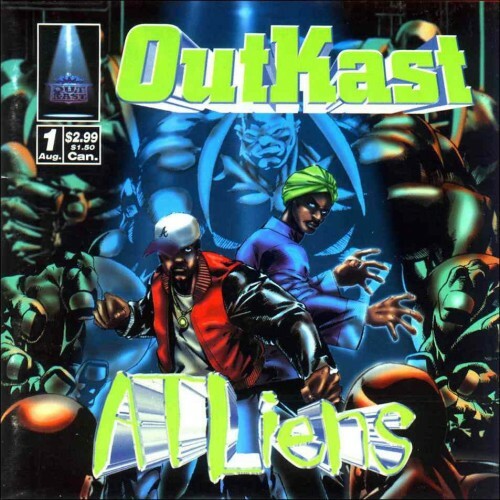 Then they became ATLiens. The impetus for their extraterrestrial alter-egos is complex–Parliament/Funkadelic, the moon-gazing of dub reggae, Afro-Futurism, and the critical isolation of Southern rap were all facets of the ATLien personas. The Outfit, TX are Texas’ most underrated rappers. Dallasites Dorian, Mel, and JayHawk described their debut Starships & Rockets: Cooly Fooly Space Age Funk as “tak[ing] listeners into outer space in the passenger seat of an ’84 Biarritz.” To say that the trio have spacemen alter-egos would be an exaggeration–they’re spacemen in real life, too. Deltron 3030 takes place in a dystopian 30th-century, in which Deltron Zero (as voiced/rapped by Del Tha Funkee Homosapien) does battle against an oppressive New World Order. Defying the edicts of the New World Order, Deltron Zero wins the “interspectacular,” “battle of all battles” Galactic Rhyme Federation Championship before returning to earth and having his memory wiped. Event 2, a follow-up, was released in 2013. William Gibson’s Neuromancer describes Zion, a space station filled with Rastafarians. Ras G and his studio, the Spacebase, are something akin to a terrestrial version of Gibson’s Zion meets Sun Ra’s Arkestra meets boom-bap hip-hop. A sampling of Ras G’s album titles: Ghetto Sci-Fi, Brotha From Anotha Planet, Down 2 Earth, Spacebase Is The Place. Afrika Bambaataa & the Soulsonic Force were from New York City, but their Kraftwerk-inspired breakout single “Planet Rock” was from the cosmos. The group was helmed by Bambaataa, a reformed member of the city’s notorious Black Spades gang, and included Mr. Biggs, Pow Wow, and the excellently named MC G.L.O.B.E. in costumes that looked like African dignitaries from outer space. Necessity is the mother of all invention. Quasimoto was invented because Madlib disliked the sound of his deep voice. In his place is “Lord Quas,” a high-pitched cartoon originally based on drawings from La Planete Sauvage. Quas isn’t quite alien (although perhaps alien to mainstream morality), nor is he an aardvark (he looks eerily akin to Dave Sim’s Cerebus, though). Even Stones Throw’s Jeff Jank isn’t sure whether or not Lord Quas is from outer space. As with most Wu-Tang-related projects, there’s misinformation surrounding GZA’s Dark Matter. Despite a seemingly fluid release schedule, and vague murmurs about concept, here’s what we know: GZA’s worked with legendary composer and synth pioneer Vangelis, astrophysicist Neil deGrasse Tyson, and violinist Marco Vitali. Dark Matter will supposedly be based on a journey through space and time, but it’s unknown whether or not GZA will be the one undertaking said adventure. If your insurance covers treatment with Dr. Octagon, you may want to consider changing health care providers. Dr. Octagon, one of Kool Keith’s seemingly infinite array of alter-egos, is a murderous, time-traveling alien, and the central character to the album Dr. Octagonecologyst. Produced entirely by Dan The Automator, it was the high-water mark for Keith’s solo career, and despite the patent ridiculousness of the concept, the album was a critical and commercial success.